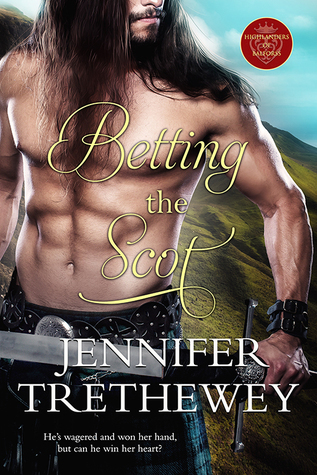 Jennifer Trethewey’s Highlanders of Balforss series features brawny Scots, sweeping romance, and nonstop adventure, all laced with a liberal dose of humor. Her foundation for storytelling is grounded in her long career in theater as co-founder and former co-artistic director of Renaissance Theaterworks, one of the most successful and longest running women’s theater companies in America. 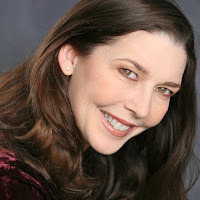 As an actor-turned-writer, she has moved her performances from the stage to the page and invites you to enjoy the drama of the Scottish Highlands in Tying the Scot, Betting the Scot, Forgetting the Scot, and most recently, Saving the Scot. Oh my God, I have so many first loves, I don’t know where to begin. Brace yourselves. I’m using real names here. The first boy I remember crushing on was Richard Carroll. He had big brown eyes and sandy brown hair. I sat behind him in third grade. We were learning how to square dance in gym class, and he was my favorite partner. But when it came time for the class demonstration, I was assigned a different partner. I started to cry (which was weird because I don’t remember crying in grade school any other time), and Richard turned around and said, “Don’t cry, Jennifer. I still like you best.” If my family hadn’t moved to a different state, I’m pretty sure I would have married him. Hang on. I’m going to go look him up on Facebook … I’m back. I couldn’t find him. My first boyfriend was David Faulk. I was fourteen, and my braces had just been removed on the day we met. He was sixteen and had his license, but my dad said I couldn’t go on “car dates” until I had my license. His reasoning was that, if there was an emergency, I could drive the car (but we all know that was total bull-oney). I was pretty sure I was in love with David because he was tall and handsome and had sandy brown hair. He also played the guitar, which made him especially appealing. David was super smart and went to a private boarding school. That year, he invited me to his prom. Mom and I shopped for the perfect prom gown. It was lime green dotted Swiss with a high neckline; empire waist; and rickrack around the collar, sleeves, and hem. David was not impressed. He said I looked like a cookie. I pouted the rest of the dance, and that was the end of the romance. I still have the gown, though. But my first real love was Tony Tribou. I swoon thinking about Beautiful Tony. Captain of the hockey team, captain of the track team, and captain of the cross-country team. So, yeah, incredible physique. He had sandy brown hair too (what’s up with that? ), crystal blue eyes, and a chipped front tooth that made him irresistible. He was a year older than me and such a good boyfriend. Perhaps the most endearing quality was that his favorite album was the original cast recording of Mary Poppins with Julie Andrews. I wasn’t allowed to tell anyone, though. This is a photo from Tony’s senior prom. 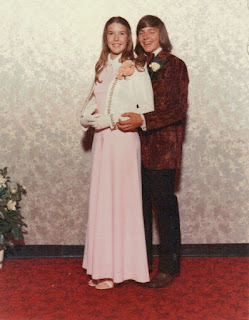 Crushed velvet tuxes were the rage in ’72. My taste in prom dresses had gotten slightly better, and it was the best prom because I was Tony’s date. If they survive this trip, it’ll be a miracle. Please fill out the Rafflecopter form. Special thanks to Jennifer Trethewey for sponsoring this giveaway. Crushed velvet: so cool and luxurious! I should have a crushed velvet tuxedo in dark green, I think! Oh yes. Green would be lovely but it must have very wide lapels! Oh, I love your first loves! How fun and sweet. They all sound like really nice guys! THey were. But it turns out, my husband is the best and truest of them all! Sounds great!! I put it on my tbr list. Who has been the hardest character to write? It's weird, because the hardest was also the one I loved the most out of my four Sinclair hero guys. Declan (second book, Betting the Scot). Is a dreamer and he's the sweetest, but most lethal of the men because he's like a fox. Because he's so sweet, it was hard to write that balance of soft and hard. Oh yes, Lori. THe dress I word in the photo was made from a Butterick pattern, I think. It was a halter top gown under the bolero jacket. Gawd the 70's styles were awful. Me too. What's not to like about a good-looking guy in a kilt? Loved your story. What happened with Tony?